View of “Zak Kitnick,” 2013. Like John Baldessari's What Is Painting, 1968, Zak Kitnick’s recent wall-mounted sculptures are playfully self-reflexive. Available in thirty-two permutations, each sculpture comprises a monochrome steel shelving unit holding multiples of the same unit stacked one on top of the other, constituting an absurd display of displays, as in Family, Health, Community, Cultivate Social Life, Strengthen Family Ties, Improve Health, Wood, Green, 2013. (One wonders if they obliquely parody the recent ubiquity of artworks that, by telegraphing their value as a financial investment, seem to sell themselves.) The sculptures are complemented by a similarly industrial series of vertical steel panels, which are coated with a silvery powder and printed with planes of matte black, like Love and Marriage, Kun (Earth), Pink, Love/ Relationship, 2013, installed on the walls of the gallery space. Though not readily apparent to the uninitiated, the shapes of black on the panels, like the colors and placement of the shelves, were determined by overlaying the Bagua grid of Feng Shui—a three-by-three rubric of color-coded elements such as wealth, health, and creativity—over a map of the gallery. Cribbed from the internet, Kitnick’s hokey-looking Bagua grid suggests the impoverishment of esoteric forms of knowledge in the digital age, as well as the reduction of artmaking to a banal formula: Like acquiring the right MFA degree or claiming the right influences, the Bagua grid guarantees success. By invoking the design principles of Feng Shui, Kitnick ups the ante on the trope of artist-as-designer. At stake, as the square form of the Bagua grid indicates, is the legacy of Minimalism. 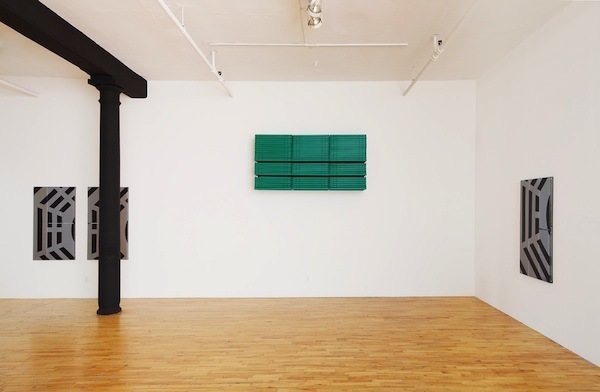 But while other artists interpret that legacy stylistically (as in the parlor game “Judd or IKEA?”), Kitnick’s turn to Feng Shui foregrounds Minimalism’s interest in phenomenological space. It also reminds us of the latent irrationality of Conceptualism (evidenced by the works of Sol LeWitt, which echo here), as the deployment of Feng Shui to motivate abstract works of art is simultaneously systematic and ludicrous.